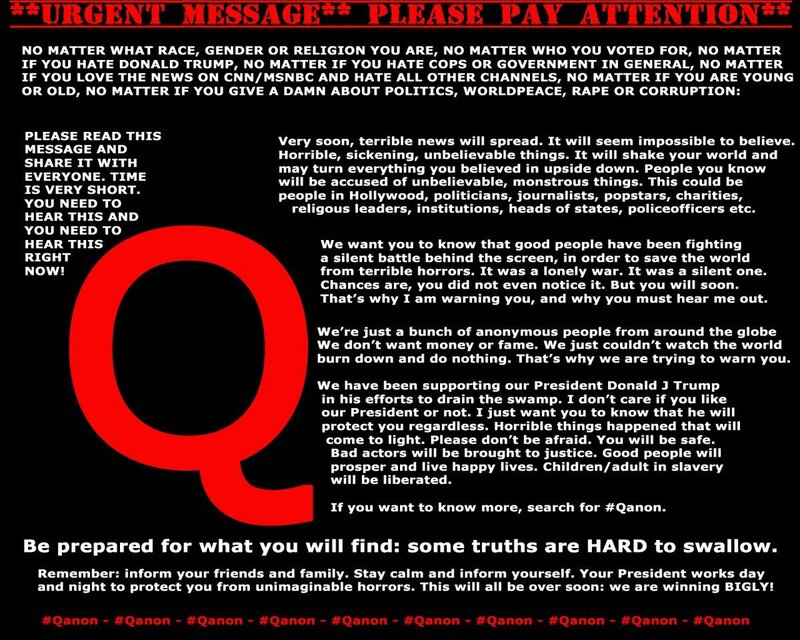 According to this report, QAnon is believed to be a high-level government insider with Q Clearance—a United States Department of Energy security clearance comparable to a United States Department of Defense Top Secret Clearance With Sensitive Compartmentalized Information Access (TS-SCI)—who, on 28 October 2017, began “dark web” postings at the Politically Incorrect (pol) message board of the English-language imageboard website 4chan—and whose influence in America has risen to such stature, Time Magazine has named this deep-cover US government informant as one of “The 25 Most Influential People on the Internet”. Of the most important revelations being made public by QAnon, this report details, are what are called “sealed indictments”—that are formal accusations of a felony, issued by a grand jury based upon a proposed charge, witness testimony and other evidence presented by, in this case, US District Attorneys—and that, according to a 2009 report from the US government’s own Federal Judicial Center, average 1,077 a year. 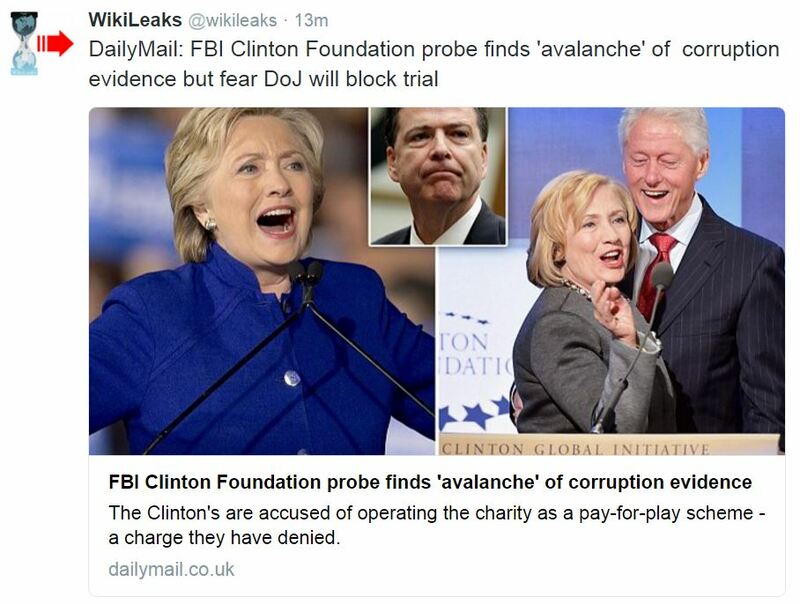 However, and according to a believed to be CIA-linked journalist named David Seaman, who is reported to have close ties to QAnon—and who has regularly appeared on CNN Headline News, BBC World Service, FOX News, ABC News Digital, Coast to Coast, RT America, Young Turks, and elsewhere, and who now runs the Fulcrum News Service out of Washington D.C.—this report continues—on 21 December 2017, President Trump signed an Executive Order moving the United States into a National State of Emergency—that enables the government to appropriate resources without US Congressional oversight. Beginning in November, 2017, immediately prior to President Trump’s secretly declaring that the United States was in a National State of Emergency, this report further details, the number of “sealed indictments” being issued by US District Attorneys, throughout the entirety of America, and as documented by QAnon, exploded—with the number of these sealed criminal indictments handed down in just the first few weeks of November being reported as 4,289—on 1 January 2018, that number jumping to over 9,000—by 4 March 4 their reaching 18,500—by early April their number reaching 24,500—and today their numbers reported and verified to be over 40,000. Important to know about the tens-of-thousands of “sealed indictments” being issued by US District Attorneys, and documented by QAnon, this report says, are that they are actually freely available to anyone through the United States Public Access To Court Electronic Records (PACER) system—and that are constantly monitored by the Foreign Intelligence Service (SVR), as well as every other major foreign intelligence service in the world. For the first time though, this past fortnight, this report notes, an “intersection” between the SVR’s monitoring of the PACER system and QAnon “sealed indictment” postings was met—and was due to 22 of these “sealed indictments” flagged as “critical to watch” by QAnon being unsealed in the State of West Virginia—that when “unsealed” revealed a 22 count criminal indictment against West Virginia Supreme Court Justice Allen Loughry—and that if convicted on all of these charges, would see Justice Loughry facing up to 395 years in prison and $5.5 million in fines. 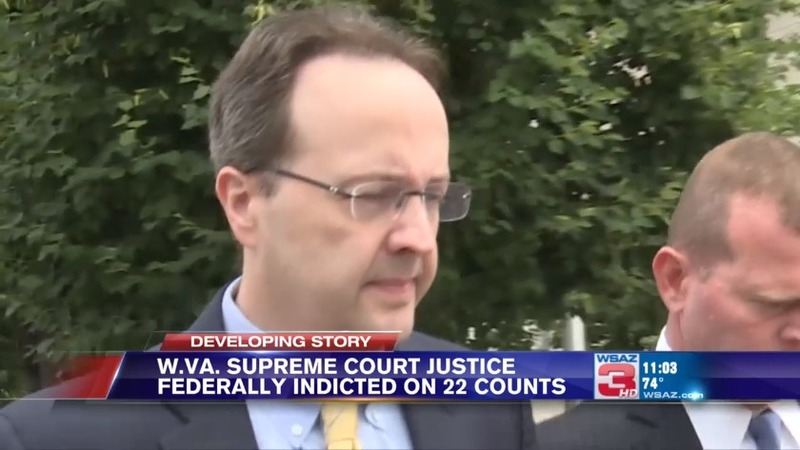 As noted by American legal experts about this now “unsealed indictment” of Justice Loughry, though, this report says, left unexplained in the 22 count 31-page criminal indictment against him is why a supreme court justice would risk his career for what amounts to petty cash: $600 in allegedly false mileage reimbursements and $1,239 in allegedly false credit-card purchases. To explain why Supreme Court Justice Allen Loughry was targeted by loyal Trump forces, the unclassified portions of his SVR file reveals, was due to his being a protégé of former West Virginia Governor William Gaston Caperton III—with Governor Caperton III being a Democratic Party stalwart defender of President Bill Clinton whom he helped get elected in 1992—and Justice Loughry further being linked to US Senator John McCain—who wrote the forward for Loughry’s 2006 book titled “Don’t Buy Another Vote, I Won’t Pay for a Landslide: The Sordid And Continuing History of Political Corruption in West Virginia”. With the “lying near death” US Senator John McCain being one of the main perpetrators in the plot to bring down President Trump—and whom Trump continues to slam on an almost daily basis—this report continues—it was no surprise to the SVR when, on 9 January 2018, Michael B. Stuart was sworn in as the new United States Attorney for West Virginia—with it to be particularly noticed that now US Attorney Stuart, also, in 2016, was Trump’s campaign chairman for the entire State of West Virginia. Even more important to note about US Attorney Stuart, this report details, is that in the weeks just prior to his being appointed by Trump, he was summoned to Washington D.C. to meet with United States Attorney John Huber—who himself, on 17 November 2017, was appointed by US Attorney General Jeff Sessions to investigate the FBI’s surveillance of Carter Page and connections between the Clinton Foundation and Uranium One—thus explaining why US Attorney Stuart traveled to Arkansas after meeting with US Attorney Huber, and prior to his being sworn in—as in the days just prior to US Attorney Stuart being sworn in, in early January 2018, the FBI in Little Rock, Arkansas, opened a new investigation into the Clinton Foundation—immediately after which, QAnon began to document thousands of “sealed indictments” being filed—22 of which US Attorney Stuart used against Supreme Court Justice Allen Loughry to, undoubtedly, squeeze out of him everything he knows. While Trump loyal forces continue churning out “sealed indictments” by the thousands, this report continues, an equally mysterious legal process is playing itself out in the US Federal Court—and whose central figure is the President Ronald Reagan appointed Senior United States District Judge Thomas Selby Ellis III—who is pitted against the President Obama appointed United States District Judge Amy Berman Jackson in deciding the fate of former Trump campaign chairman Paul Manafort. 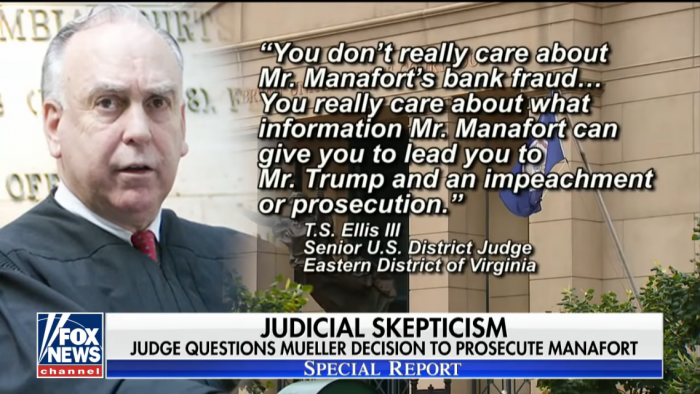 With Judge Jackson being described as a “criminal in a robe” who has thrown Manafort into solitary confinement without his being convicted of any charges, this report details, Senior Judge Ellis, nonetheless, has accurately described Manafort’s prosecution as being political with his declaring “even a blind person can see Mueller is using Manafort to target Trump”. In seeking to extricate the US Federal Court from being a party to what is in essence a coup against President Trump, this report says, Senior Judge Ellis, this past week, released his decision denying a motion filed by Manafort against the “expanded powers” used by Special Counsel Mueller to charge him—but whose true reason for doing so can be plainly seen by his going out of his way to say that his decision should not be read as approving the appointment of a special counsel. Most critical to note about Senior Judge Ellis’s decision, this report notes, is that Manafort’s attorneys didn’t even ask him to rule as to whether Special Council Mueller’s appointment was legal—thus allowing Senior Judge Ellis to provide for them (and anyone else charged by Mueller) the exact legal basis to challenge Mueller’s appointment—and whose road map to do so Senior Judge Ellis laid out clearly by his twice citing in his ruling one of America’s top constitutional lawyers, Northwestern University Clayton J. and Henry R. Barber Professor of Law Steven G. Calabresi. Mr. Mueller’s investigation has crossed a constitutional line, for reasons the U.S. Supreme Court made clear in the 1988 case Morrison v. Olson. That case is best known for Justice Antonin Scalia’s powerful lone dissent arguing that the post-Watergate independent counsel statute was unconstitutional. But Chief Justice William Rehnquist’s opinion for the court, while upholding the statute, set forth limits that the Mueller investigation has exceeded. At issue is the Constitution’s Appointments Clause, which provides that “principal officers” must be appointed by the president with the Senate’s consent. Mr. Mueller, in contrast, is investigating a large number of people and has already charged defendants with many different kinds of crimes, including—as in Mr. Manafort’s case—ones unrelated to any collaboration between the Trump campaign and Russia. That’s too much power for an inferior officer to have. Only a principal officer, such as a U.S. attorney, can behave the way Mr. Mueller is behaving. Mr. Mueller is much more powerful today than any of the 96 U.S. attorneys. He is behaving like a principal officer. Rehnquist’s majority opinion has never been overturned. n Edmund v. U.S. and in Free Enterprise Fund v. Public Company Oversight Board, the justices said that an officer cannot be inferior unless he has a boss—as Mr. Mueller does in Deputy Attorney General Rod Rosenstein, who appointed him. But that’s not a sufficient condition. As a principal officer, Mr. Rosenstein could legally have brought all the indictments Mr. Mueller has. But he may not delegate that authority to Mr. Mueller, any more than President Trump could delegate his veto power to Mr. Rosenstein. Armed with Federalist Society co-founder Professor Steven Calabresi’s legal roadmap to challenge the constitutionality of everything Special Counsel Mueller has done, this report continues, the American attorneys representing the Russian firm Concord Management charged by Mueller in a “joke indictment” have now filed a motion in US Federal Court challenging his authority—and whose merits of will be ruled on the President Trump appointed US Federal District Judge Dabney Friedrich. 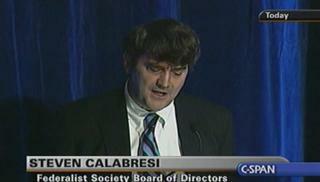 Likewise, this report notes, a further challenge to Special Counsel Mueller’s constitutional authority following the roadmap laid out by Federalist Society co-founder Professor Calabresi is being made by the long time Trump backer Roger Stone’s former aide Andrew Miller, through his attorneys from the Federalist Society aligned non-profit conservative legal organization National Legal and Policy Center, to quash a Mueller grand jury subpoena—but whose merits of will be heard by the President Obama appointed Chief United States District Judge Beryl A. Howell. 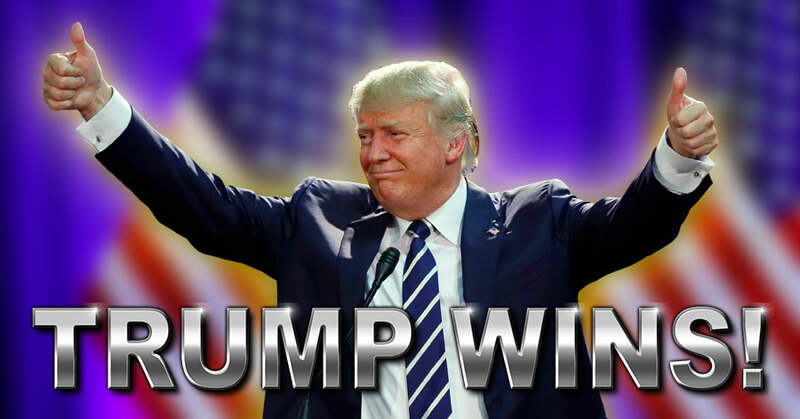 With President Trump appointed Federal Judge Friedrich expected to side with the Federalist Society legal determination that Special Counsel Mueller’s appointment is un-constitutional, after which President Reagan appointed Senior Federal Judge Ellis will quickly follow suit once Manafort’s attorneys file a motion for him to do so, this report concludes, a titanic legal war will then erupt because President Obama appointed Chief Federal Judge Howell and Federal Judge Jackson will, most certainly, rule the exact opposite—thus leaving the United States Supreme Court to be the final determiner of this issue—and whose Federalist Society members include Chief Justice John Roberts, Associate Justice Clarence Thomas, Associate Justice Samuel Alito and Associate Justice Neil Gorsuch—and is why the coup plotters against President Trump have become so enraged after Associate Justice Anthony Kennedy announced his retirement—as the soon to be Trump appointed next Federalist Society nominee for the United States Supreme Court will hold the fate of Trump, and their country, in his or her hands—but none of whom have ever gone against their societies founder Professor Calabresi’s determinative constitutional legal opinions. July 2, 2018 © EU and US all rights reserved. Permission to use this report in its entirety is granted under the condition it is linked back to its original source at WhatDoesItMean.Com. Freebase content licensed under CC-BY and GFDL.